The Terra Grappler® offers year-round all-terrain performance through a balance of wet and dry performance and on-road comfort with minimal road noise. The Terra Grappler® All Terrain provides balanced performance in all weather conditions over various terrains. Staggered shoulder lugs help dig into sandy and rocky terrain to maintain traction. Angled, lateral voids were engineered to channel away water in wet conditions and provide forward stability in dry conditions. Coupling joints connect lugs to reduce tread flex, increasing stability at high speeds. High-density siping is optimized to resist hydroplaning and increase traction in the wet and snow. Circumferential voids help the tire maintain straight line traction. The lugs on the shoulder are staggered to improve traction in deep sand and loose dirt. Deep sipes and lateral voids effectively channel away water. Siping helps resist hydroplaning by cutting through pockets of water on road surfaces. This technology provides all-season traction. The tread pattern void ratio is balanced for off-road traction and on-road handling. Coupling joints between tread block elements reduce excessive flex for better traction and steering response on and off road. 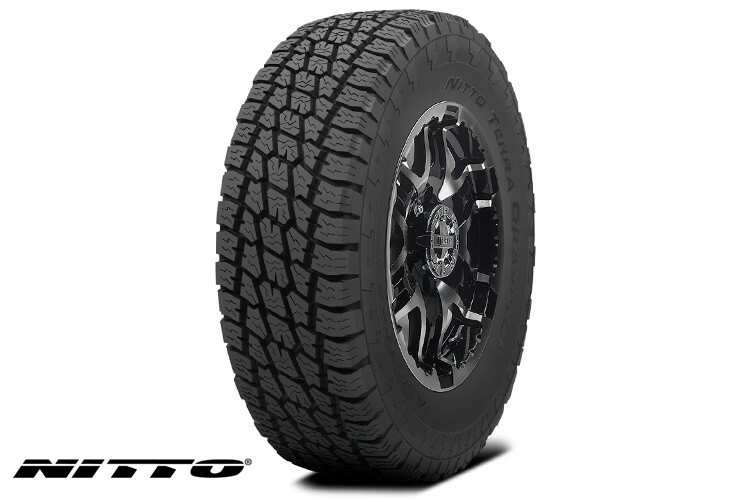 Each Terra Grappler has two sidewall designs so you can pick which one faces the road. One side has solid outlined lettering and the other has striped lettering. Technical specs are subject to change without notice.